15:15 Check in at International Departure Hall – OR Tambo. 18:15 Depart on Turkish Airlines flight TK039 to Istanbul. Your baggage allowance is 30 kg for checked baggage and meals are served on board. Your baggage will be checked through to Zagreb. 05:00 Arrive in Istanbul. Remain in transit. Change flights. 07:15 Depart on flight TK1053. 08:35 Arrive in Zagreb. Clear passport formalities and collect your luggage. After clearing customs, meet your driver who will direct you to your coach. Morning sightseeing tour of Zagreb with English speaking guide. Highlights is the central square with flea-markets on the square and on the streets flowing from the square. Drive by beautiful architectural buildings and historic cathedrals. Enjoy some free time around the main square for own lunch. 14:00 Check in at the 3* Hotel Jadran located 750 m from the main square and relax and freshen up. 19:00 Welcome dinner at a local restaurant and overnight at the hotel. 10:00 Check out and depart by coach. Travel for 380 km’s to the coastal harbor town of Trogir. En-route you will visit the town of Zadar which is famous for its sea organ. The Sea organ is an architectural sound art object and an experimental musical instrument, which plays music by way of sea waves and tubes located underneath a set of large marble steps. Here you will have time for getting your own lunch. Continue to Trogir. 17:00 Estimated time of arrival and check in at your 3* Hotel Sveti-Kriz – translated Hotel Saint Cross. Trogir is a historic town and harbor on the Adriatic coast in Split-Dalmatia County, Croatia, with a population of ±13,000. Trogir is a living monument to medieval art and architecture. Named as a UNESCO World Heritage Site in 1997, Trogir developed from the 13th to the 15th centuries and was once the cultural center of Dalmatia. Its golden age is visible everywhere. Evening at leisure with own dinner and overnight. 07:30 Breakfast at your hotel. 08:30 Check out and depart by coach to Split. Morning visit Split. Split, a town on Croatia’s Dalmatian Coast, is known for its beaches and the fortresslike complex at its center, Diocletian’s Palace, erected by the Roman emperor in the 4th century. Once home to thousands, its sprawling remains include more than 200 buildings. Within its white stone walls and under its courtyards are a cathedral and numerous shops, bars, cafes, hotels and houses. 13:00 Arrive at the harbor and check in for your cruise. Each cabin of 2 persons has its own toilet and shower, with air-conditioning. After the safety drill, depart by sea along the mainland coast to the harbor of Omis. This is only 25 km’s apart. Dock in Omis and go on shore. Here you can hire a canoe on the river Cetina, or you can go up the hill and visit a nice Fortress. There are a number of excellent seafood restaurants along the Fosal ul. with great views across the Cetina river where you can enjoy dinner and a nice glass of Croatian wine. Day 5. – Omis – Stari Grad. Sail along the Adriatic to the next island of Hvar where will dock in Stari Grad. Enjoy the lovely weather on deck. Along the way, you will also enjoy lunch on board. Stari Grad (Pharos) is the oldest town in Croatia. The same year – 384 b.c. when Greek philosopher Aristotle was born in Trakia, the Greeks from the island of Paros in Aegean Sea have settled the town on the island of Hvar, and named it Pharos. Stari Grad (eng. “old town”) is historical heart of the island of Hvar. The town is situated in a landscape where the blue of the deep bay touches the green of the wide and famous field of Pharos, with vineyards and olive-groves. The fields used to provide sustenance and the bay provided protection. Today, both the fields and the bay add an attractive quality to the island, in which the modern vacation sights have become intertwined with the antiquities of the town and of the island. You have the opportunity for some excellent wine tasting here. A walk through the Stari Grad center, narrow streets and small squares brings the whisperings of the past times. Enjoy your own dinner and overnight on board. Breakfast in the dining lounge. Sail from Stari Grad around the same island to the other side. the fish must swim 3 times, first in the sea, then in the oil (in the plate), and third in the wine (in your stomach)! Sail from Hvar to the island of Vis. Lunch on board. The island of Vis is a pearl among Croatian Adriatic islands, left untouched by the development of tourism for so many years – due to its strategic location on the open sea, it served as a military zone for many years. Since the independence of Croatia, the island began opening slowly to the outside world, offering its unique traditions, history, cultural heritage and natural beauties to the outside world, and it is slowly becoming one of the most popular tourist destinations in Croatia. The island of Vis is the most protruding Croatian island with an area of 90.30 km2. It is surrounded by an archipelago of smaller islands and islets: Ravnik, Budikovac, Bisevo, Svetac, Jabuka, Brusnik and Palagruza. The island has a rich history, and its main source of income is fishing, agriculture and tourism. Today the Fishing Museum in Komiza shows the famous history of the Vis fishermen. It is said that the first grape vine in Dalmatia and Croatia was planted by the ancient Greeks and that it was planted on a Vis field. The Greek writer Agatarhid said that the wine from Vis was, compared to all others, better. The most famous authentic white wine is definitely the famed Vis Vugava, which you can try in numerous restaurants and cellars on the island. Sail to Korcula. After lunch and getting a drink on deck arrive at the harbor of Korcula, a historic fortified town on the protected east coast of the island of Korcula. Korcula is considered as the pearl of the southern Dalmatia and offers to its visitors picturesque walled old town of Korcula, magnificent coastal panoramas, dreamlike fishing villages and idyllic coves. Away from the tourist-places on the coast of the island Korcula, in the island’s interior one discovers a unique green landscape with panoramic views and hidden cultural treasure, which one can discover either on foot or by bicycle. The coast of the island of Korcula is very indented with a large number of bays and coves Korcula island has numerous smaller and larger restaurants dotted around the Old Town as well as around villages and bays all over the island. Overnight in your cabin. Breakfast on board while you sail to Mljet. Mljet National Park is large area that borders two salt water lakes – Veliko and Malo Jezero (Large and Small Lake). The Lakes stretch for about 4 kilometres. Right in the middle of the Large Lake there is a small island / islet Melita (Sveta Marija) with large building of former Benedictine monastery, erected there in 12th century (see photo above). The monastery’s building is now café/restaurant. The small island is connected by boats that sail there from both sides of the Lake. You may at optional extra cost be taken on a 2-hour guided tour of the National Park, including visiting the Isle of Saint Mary. Dinner on the boat this evening and overnight. After breakfast, we shall raise anchor and head towards the last destination on our journey. Enjoy lunch and relax on deck. Afternoon dock in the harbor in Dubrovnik. Go ashore and explore Dubrovnik on your own. Explore your surroundings and get a nice dinner somewhere. Enjoy your last night in your cabin on board. Breakfast on the boat and disembark at ± 09:00. Transfer to your 3* Hotel Tirena (or similar) and check in. 08:00 Breakfast at your hotel. 09:00 Meet your guide in the lobby and enjoy a sightseeing tour of Dubrovnik. One of the ways to get a feeling for Dubrovnik is to take a 2 km walk around the city walls. Then, begin your walking tour at Pile Gate. You’ll quickly appreciate rich Ragusa’s security concerns when you cross over a drawbridge that was raised every night. There are two massive doors through the walls, an exterior door in a Renaissance style and a Gothic interior door topped by the statue of St Blaise, Dubrovnik’s patron saint. Straight ahead is the town’s main street, Placa (pronounced “platsa”) or Stradun, Dubrovnik’s most illustrious feature, punctuated by the clock tower at the end. Along this wide gleaming street lined with shops and cafes, all Dubrovnik’s processions take place. It’s curious to note that Stradun was actually a part of the sea until the 11th century when it was finally paved over. Right in front of the Pile Gate entrance is the circular Onofrio Fountain (named after its Neapolitan builder) built in the 15th century and sporting 16 carved masks. Unlike the rest of Dalmatia, Dubrovnik citizens were not relegated to capturing rain water; the fountain was connected by aqueduct with a spring 12 km from town. Opposite is the Franciscan Monastery with the restored sculpture of the Pieta over the entrance door. Inside is the Pharmacy dating from the 14th century and a gorgeous cloister also from the 14th century. Next to the monastery is the 16the century St Saviour Church, one of the few Renaissance structures to survive the earthquake of 1667. There are often concerts and exhibitions here. Dubrovnik’s Renaissance highlight is the Sponza Palace which now houses the State Archives. You may visit the ground floor and the Museum of the Dubrovnik Defenders. Nearby is the ornate St Blaise’s church, at the end of Stradun, dedicated to Dubrovnik’s patron saint. Inside the lavish 18th century church is a charming 15th century statue of St Blaise who holds a scale model of Dubrovnik in his hand. Notice the Orlando Column across from the church. It was carved in 1417 and has been a popular meeting place for almost 6 centuries! Another Renaissance highlight is the Rector’s Palace. It was built in the late 15th century for Dubrovnik’s ruler, the elected Rector, who held office for one month on a revolving basis and was not allowed to leave during his term. The interior has been turned into a fascinating museum with renovated rooms, furnishings and art from Dubrovnik’s glorious past. Across the square is Dubrovnik’s baroque Cathedral. Built in the 18th century after an earthquake destroyed the original, the cathedral is still being explored after excavations revealed traces dating back to the 7th century. Don’t miss the Treasury with its relics from St Blaise and a Madonna attributed to Raphael. Between the Rector’s Palace and the Cathedral is Gundulic square, scene of a morning market and the deluxe Pucic Palace hotel, the only luxury hotel in the Old Town. In the center of town is a statue of Dubrovnik’s renowned poet Ivan Gundulic. Before leaving town by the Ploce Gate; you’ll come to the Dominican Monastery with a sober exterior that blends into Dubrovnik’s walls. The art collection here centers on Dubrovnik’s finest painters, mostly from the 15th and 16th centuries. There’s also a lovely cloister dedicated to St Sebastian. 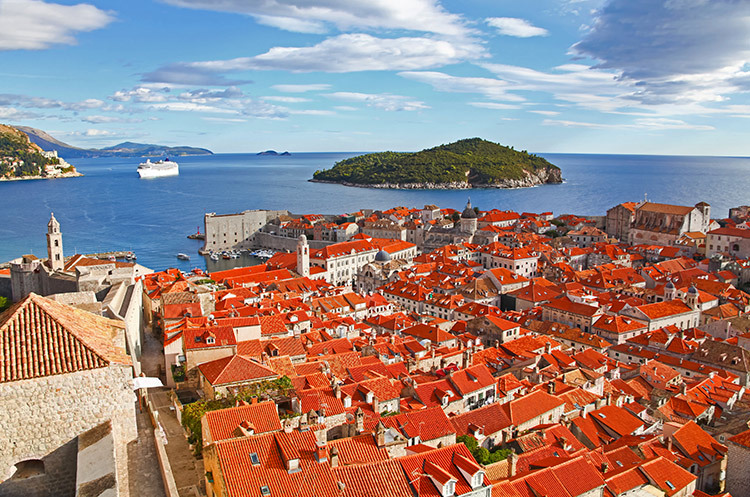 Dubrovnik is fascinating – yes it is! For dinner, you can try Pantarul. A popular spot for the locals to frequent, you must try this delectable restaurant during your visit. They offer delicious appetizers like spring rolls, quiches or steak tartare. As well, delightful risottos and homemade pasta dishes are just a few of the choices for a main course. As an additional bonus, they’re always adding new and fun meals to the menu. Tastefully decorated, the friendly staff and warm environment will leave you with a satisfied experience. The tables fill up quickly, so make sure you reserve a spot ahead of time. 10:00 Check out and store your luggage. Enjoy your last day to visit the markets or café’s in Croatia. 15:00 Collect your luggage from the hotel and transfer by coach to the airport. 16:00 Check in with Turkish Airlines. 18:45 Depart on flight TK1440 to Istanbul. 21:30 Arrive in Istanbul. Remain in transit. Change flights. 01:35 Depart on flight TK042 from Istanbul. 10:35 Arrive in Johannesburg after breakfast on board.